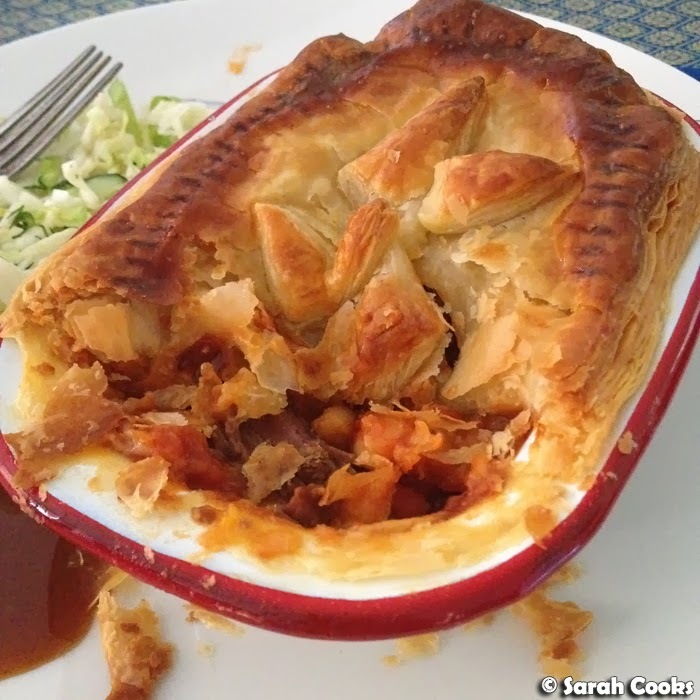 I've had this recipe up my sleeve for a little while, waiting until it was cold enough to blog a hearty beef pie recipe. It's not quite the depths of winter yet (hardly! ), but there does seem to be a chill in the air, and in my opinion, it's never really too hot for pie. So here we go! Mmm... look at all that rich sauce, with the buttery flaky pastry. 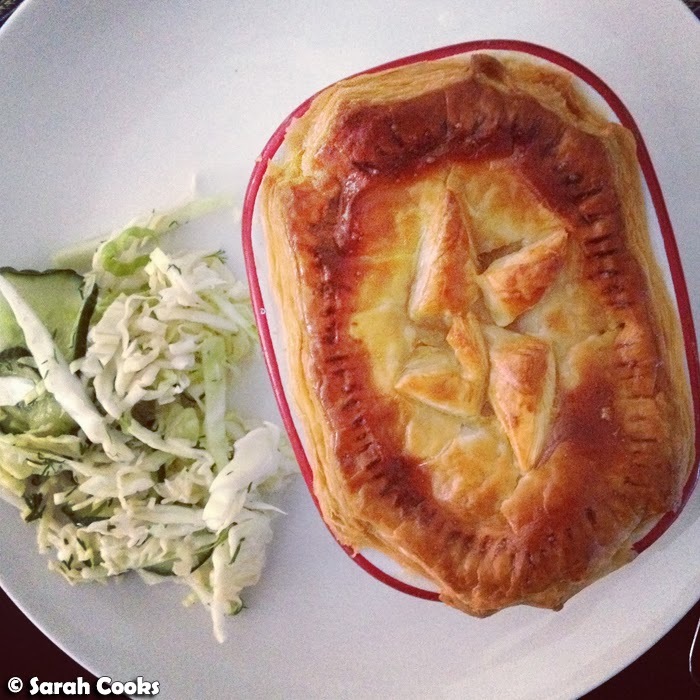 Pies truly are the best. Enjoy! Dust the pieces of beef in flour and set aside. Heat the oil in a saucepan and add the onion and carrots with a pinch of salt. Cook over a medium-high heat until softened. Add the flour-dusted pieces of beef and cook until browned all over. Add the Worcestershire sauce and tinned tomatoes. Half fill the empty tomato tin with water, swirl to get every last bit of tomato and pour the tomatoey water into the saucepan. Stir in the stock powder. Bring to the boil, clamp on the lid. Turn the heat down to very low and simmer for 1.5 hours or until the beef is tender. (Alternatively cook in a pressure cooker for 30 minutes). If the mixture is very liquid, allow it to boil strongly for a few minutes until it thickens. (If necessary, you can also whisk a tablespoon of flour into cold water, then add this mixture to the pot and boil for a few minutes). Take off the heat and stir in the cannellini beans. 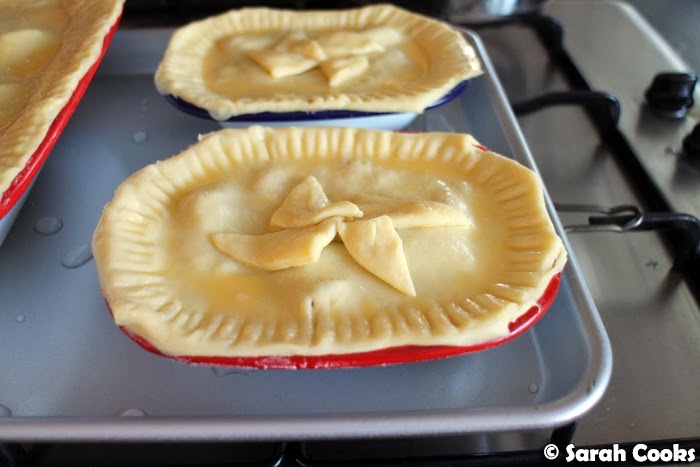 Spoon the beef mixture into four small pie dishes (mine were 10 cm wide, but use whatever size pans you have that fit). Brush the rims of the tins with a little beaten egg. Cut the puff pastry into pieces just a little larger than the tins. Place the pastry pieces on top of the tins, pressing down gently to seal. Use a fork to make decorative marks around the rim. 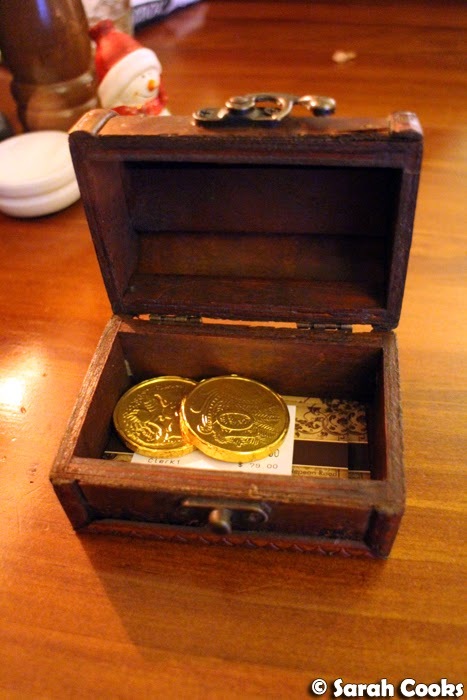 If desired, use any offcuts to decorate the tops. Brush with beaten egg. Bake the pies for 20 minutes, or until the pastry is puffed and golden, and the filling is piping hot. 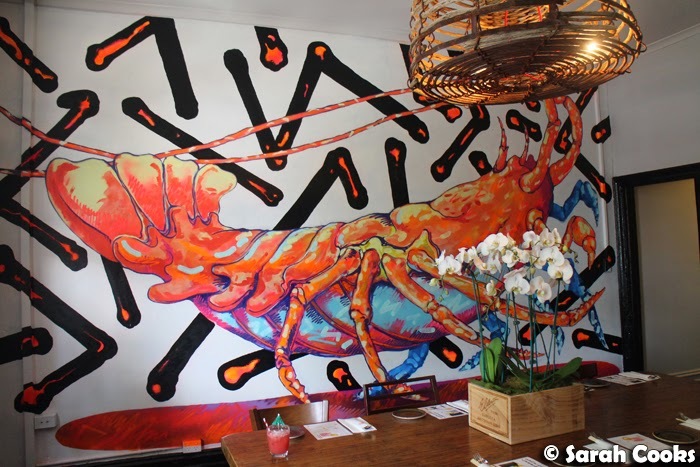 I'm always on the lookout for German restaurants, but often in Melbourne they're the cheesy touristy kind: giant beer steins, Bavarian flags, oompah-pah music, gigantic servings of sausages and schnitzels, and big rowdy groups on birthday parties or hen's nights. Not that there's anything wrong with that - and indeed, Hofbräuhaus actually does great food - but often I just want a quiet German meal without all the Firlefanz. 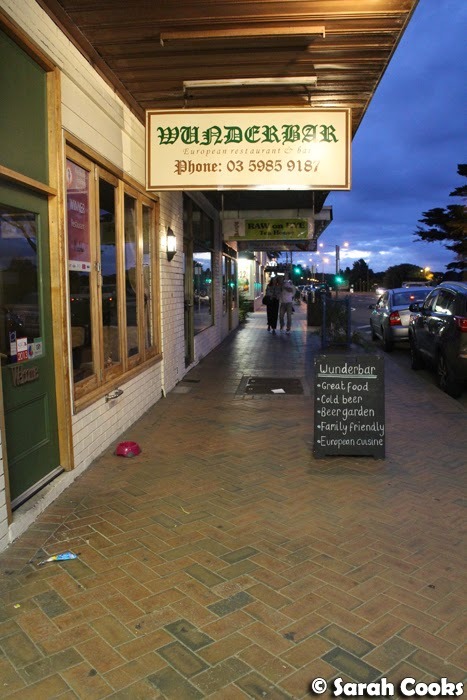 So when we were in the Mornington Peninsula for that fab weekend away, we were thrilled to find an authentic German family restaurant in Rye, right on Point Nepean Road: Wunderbar. 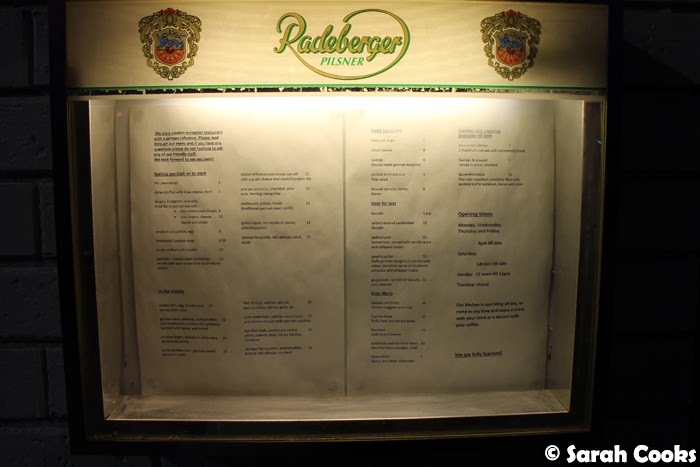 It reminded us very much of our time(s) Germany - the Radeberger-branded menu posted on the wall outside, the dark wood interiors, and all the little German knickknacks around the restaurant. They even had Dornfelder, Asbach and Feuerzangenbowle on the menu! We shared the Mettwurst as a starter, mainly out of curiousity, I must admit. 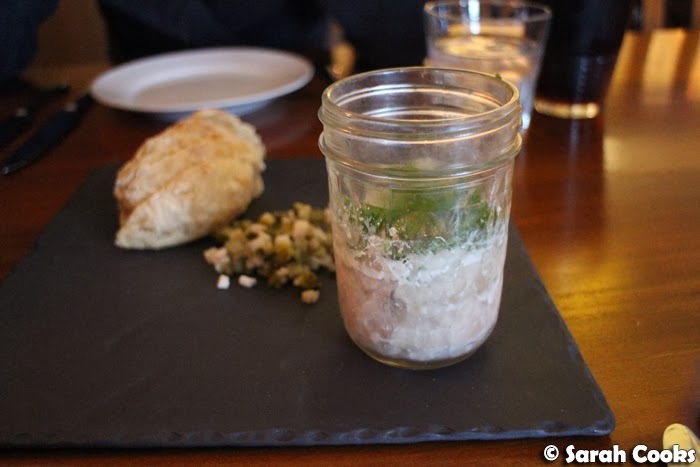 I wasn't sure what we'd get - "Mettwurst" varies even regionally in Germany - but here it was a cold meat parfait in a jar, served with diced pickles and onions and a freshly baked bread roll. And when I say "freshly baked", I mean it - it was still steaming! I wasn't a huge fan of the Mettwurst itself, finding it a bit firm and tricky to get out of that narrow jar, but I was glad to have tried it. 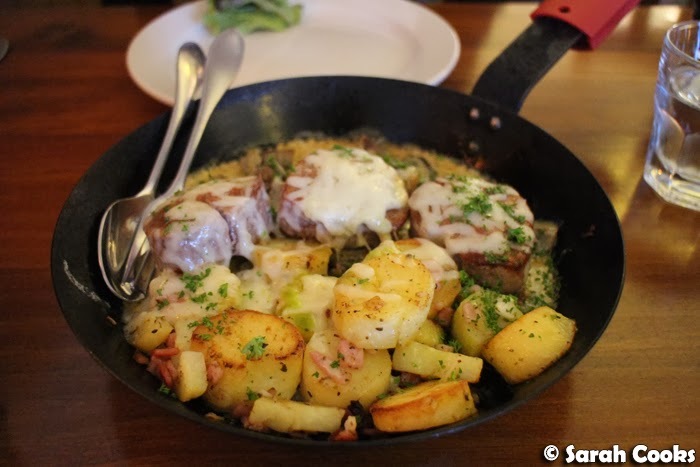 Sandra really enjoyed the pork medallians she ordered ("Lende" in German), which were covered in cheese and sat on top of a mushroom sauce. 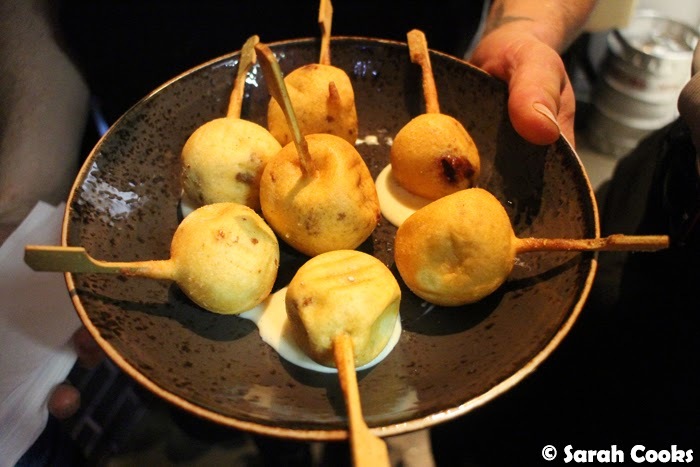 These normally come with Spätzle, but she substituted Bratkartoffeln (fried potato slices with bacon). 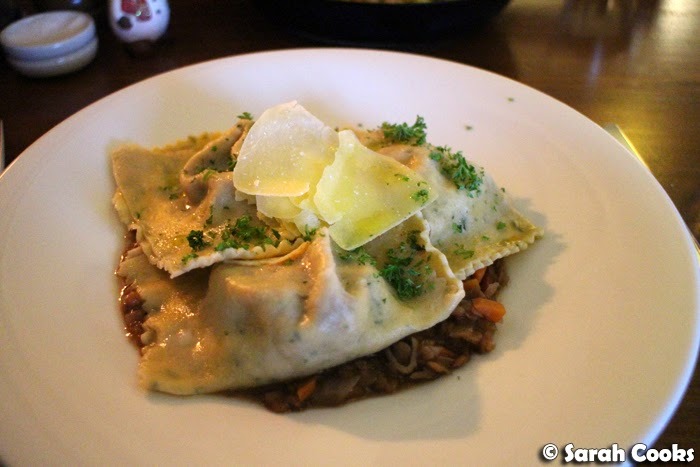 I've not seen Maultaschen here before, but have often had them in Germany - essentially they're like big square ravioli, filled with meat, and usually served in broth. These ones were served on a hearty lentil and carrot stew, which had a rich flavour from balsamic vinegar and (I believe) red wine. Lecker! We were too full for dessert, but they did have Quarkkrapfen (quark donuts) with chocolate sauce and whipped cream on the menu, which sounded amazing! I'll have to try those for next time. 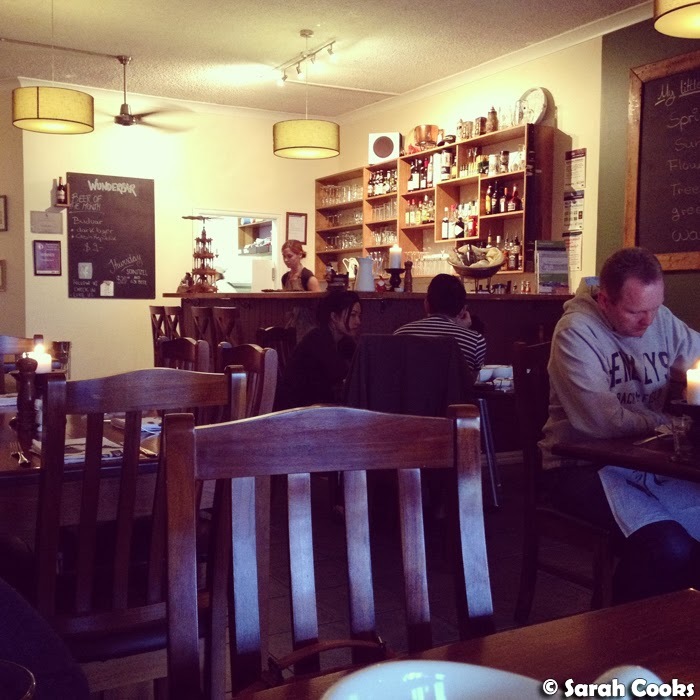 Wunderbar was a cosy, friendly little restaurant serving traditional German fare. A little slice of home on the Peninsula. I recommend it and definitely want to visit again! So, I love doughs made from spelt flour. I love the nutty, wholesome taste it gives breads and doughs. Apparently spelt flour is higher in crude fibre, protein and fat than regular wheat flour, as well as being rich in minerals and vitamins, but I must admit I only care about the taste. At uni I'd always grab a spelt tahini roll from the co-op for lunch, or often eat spelt bread toast for breakfast. However, it's only recently that I've started baking with it myself - thanks to Whole-Grain Mornings I went on a shopping spree through the health food store and now have both plain and wholegrain spelt flours in the pantry. 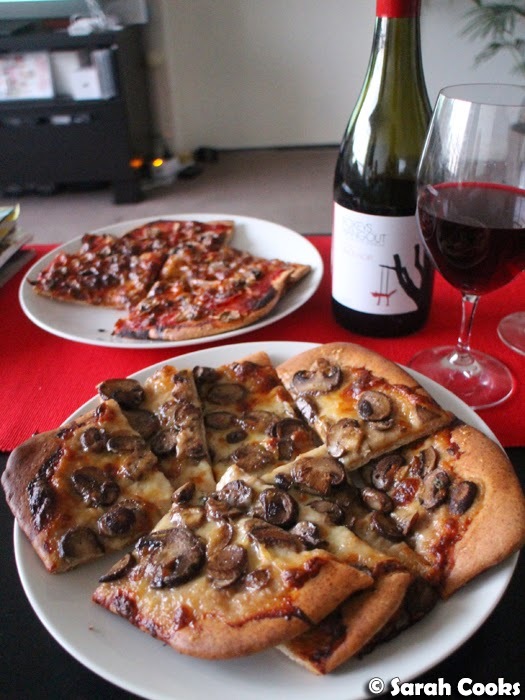 On Friday night I was at a bit of a loss for what to cook - then I thought: PIZZA! When I got home from work, I knocked up a spelt dough, and went out to buy the toppings while it was rising. Then all I had to do was stretch out the dough, chuck the toppings on and bake it. Hooray! Fresh pizza. I used that colomba technique I told you about a few years back - stretching the dough out with my fingertips and folding it over to create little pockets of air in the dough. 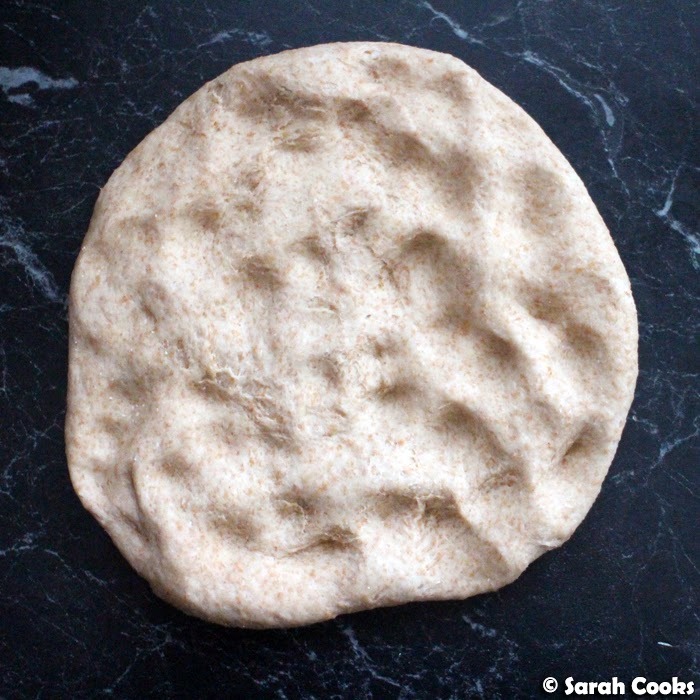 Having less gluten than regular wheat flour, spelt flour dough isn't as stretchy so you won't get loads of big bubbles (see my previous pizza post!) - so it's up to you if you want to bother with this process, or simply roll it out with no folding and pressing. ... and folding it closed. For the topping, I marinated sliced mushrooms with with olive oil, garlic, lemon zest and thyme (essentially this is the sauce from Nigella's linguine with lemon, garlic and thyme mushrooms). And there was cheese. Lots of cheese. Yum town. Perfect Friday night treat! The dough was hearty and crunchy, almost a little biscuity. 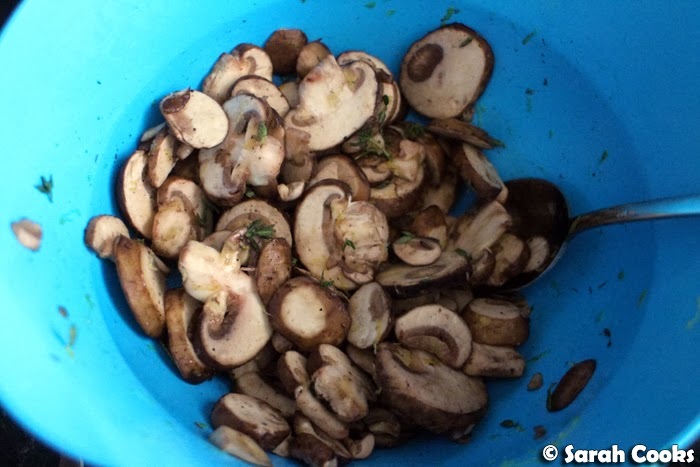 And even though I used standard button mushrooms, the mushroom flavour was wonderful and strong. If you have any truffle oil, now would be the time to use it. 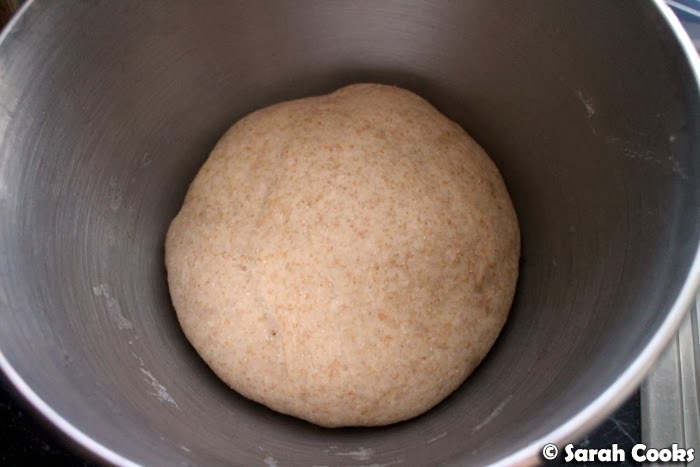 To make the dough, combine both flours, yeast and salt in the bowl of an electric mixer fitted with the dough hook. Add the water and olive oil and stir to combine. 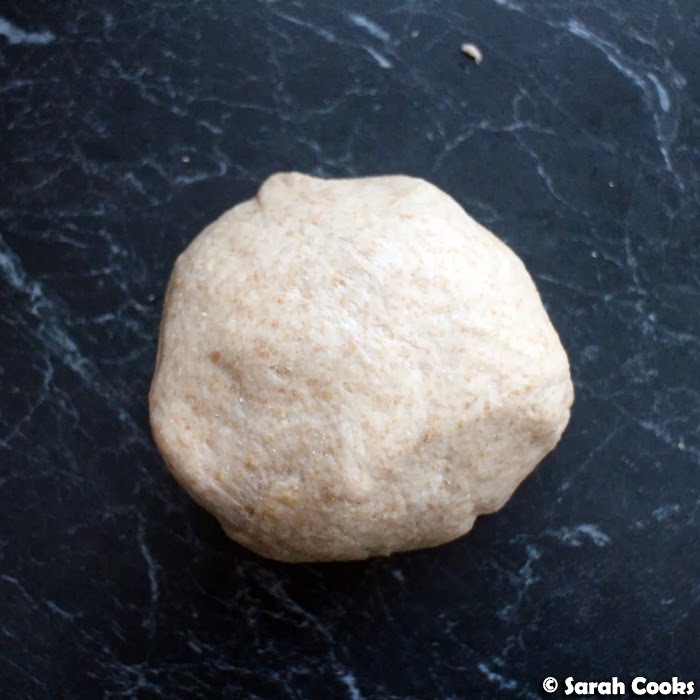 Once the dough has come together, knead for 3-5 minutes or until smooth. 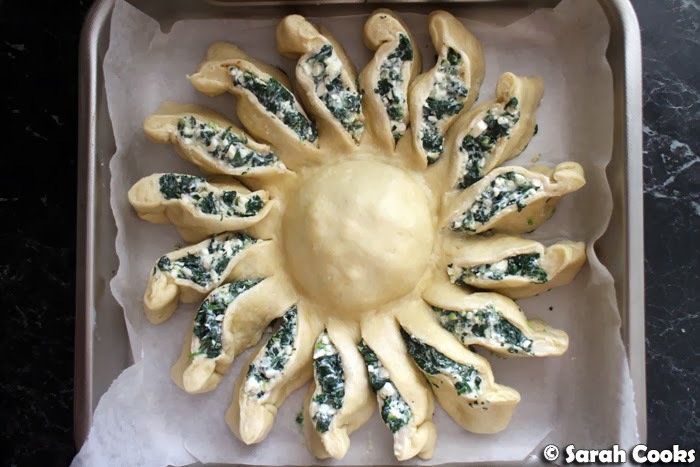 Cover with clingwrap and rest the dough in a warm spot for an hour or until it has doubled in size. For the topping, stir together all the ingredients apart from the cheese and set aside. Punch the dough down to expel the air. Knead gently and divide into two pieces. Starting with the first piece of dough, press out flat with your fingertips, so that it is covered in little indentations. 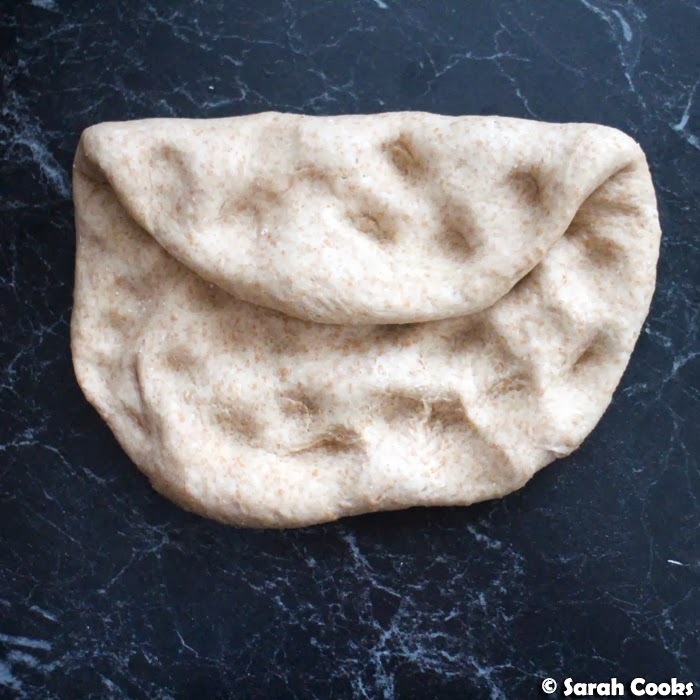 Fold the dough over in thirds like a business letter, then press out again. Fold and press out one more time. 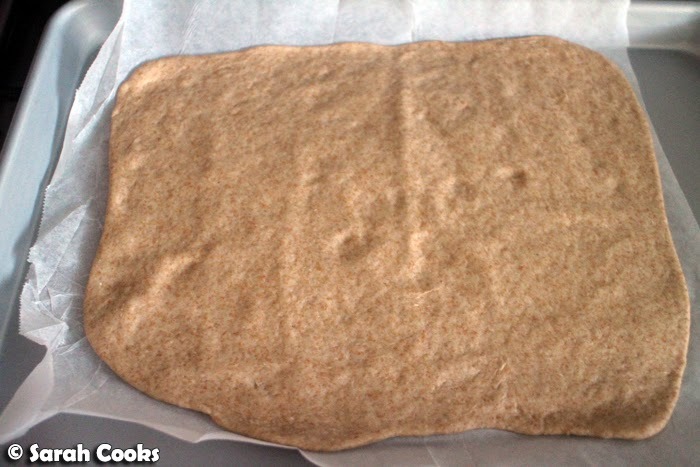 Roll out thinly and place on a lined baking tray. 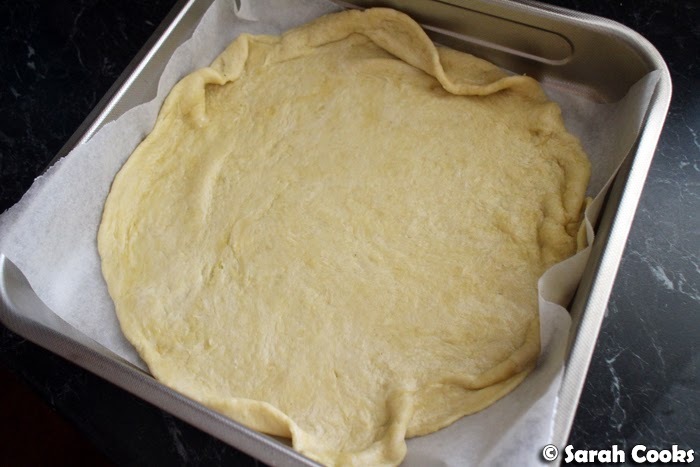 Repeat the pressing-and-folding process with the second piece of dough, roll out thinly and place on a second lined baking tray. 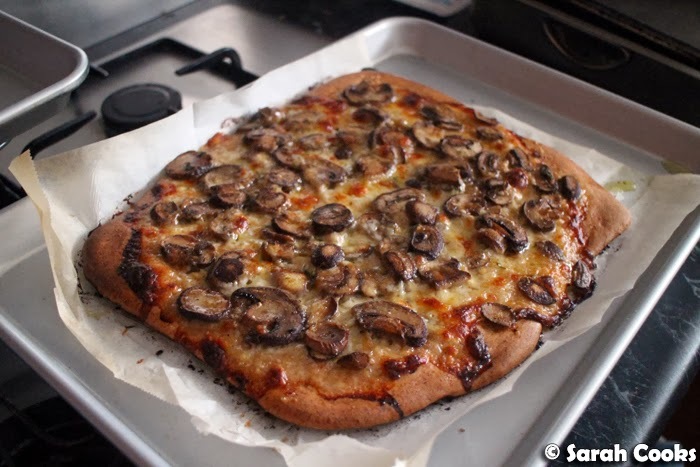 Sprinkle the dough with the grated mozzarella, grated Parmesan, and the mushrooms. 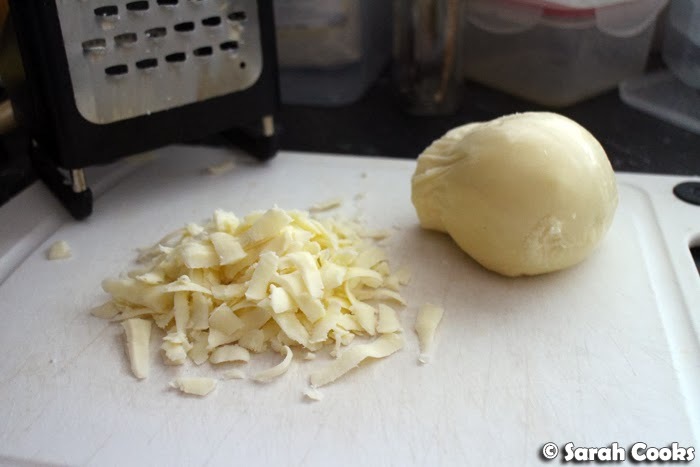 Bake for 20-25 minutes, or until the dough is cooked through and the cheese is melted and golden. Swap the trays around halfway through if necessary. Slice into chunky pieces to serve. 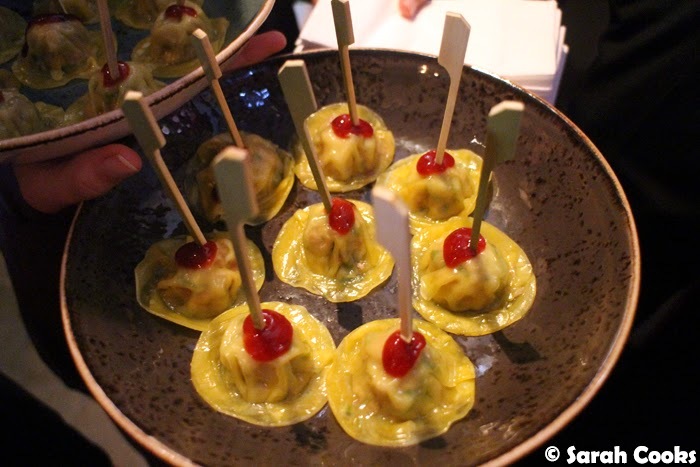 Last night I attended the launch event of Charlie Dumpling, a slick-looking new bar-slash-dumpling restaurant from Chef Dylan Roberts. 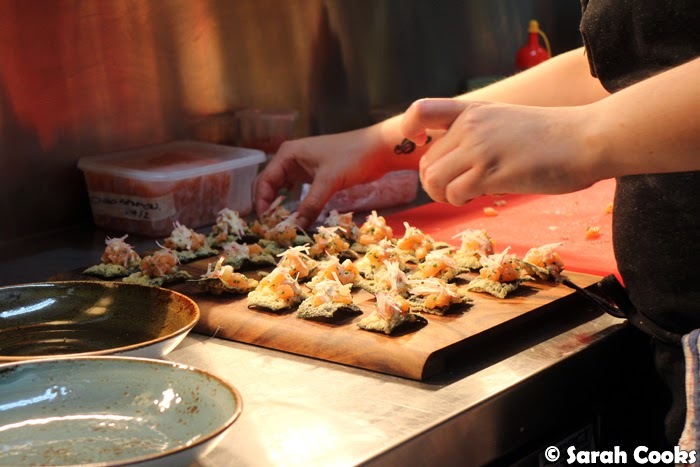 A night of cocktails, and dumplings made by one of Ezard's ex-chefs? I was totally in. 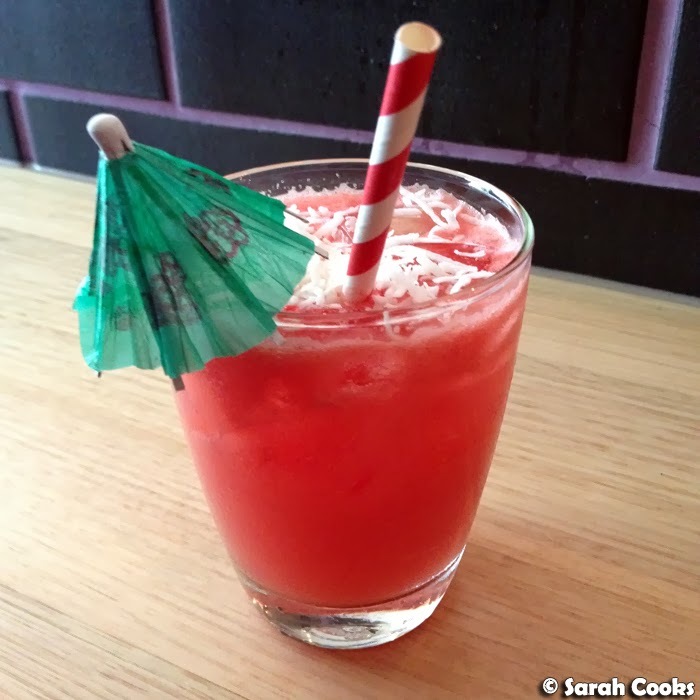 I don't normally like gin or watermelon, but these Mr C Sheen cocktails were super refreshing and totally hit the spot. As you can imagine, my favourite part was the shredded coconut! 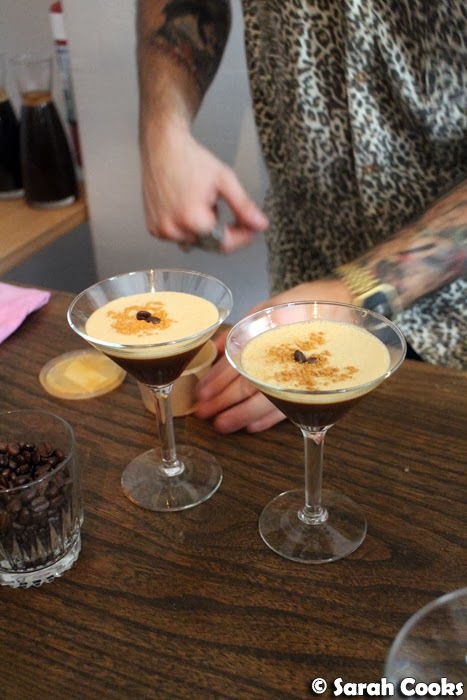 Espresso martinis are a favourite of mine (judge me if you will, I do not care) - not just for the taste, which I love, but also because the combo of coffee, vodka and Kahlua is the perfect pick-me-up after work and before going out. 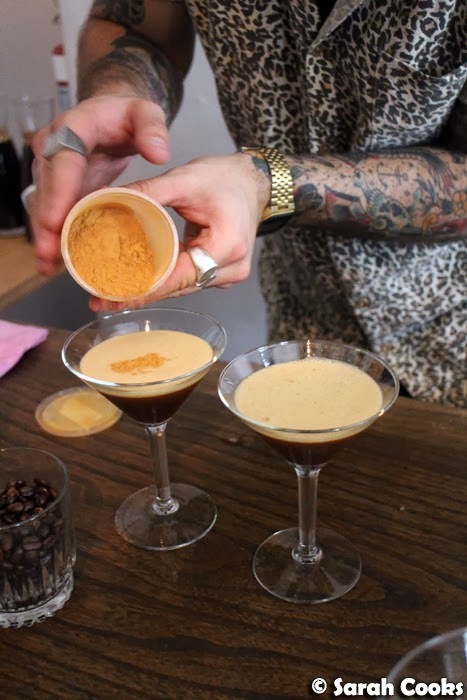 We really enjoyed these, and I especially liked the dash of cinnamon on the top. Let's have a look at the food! 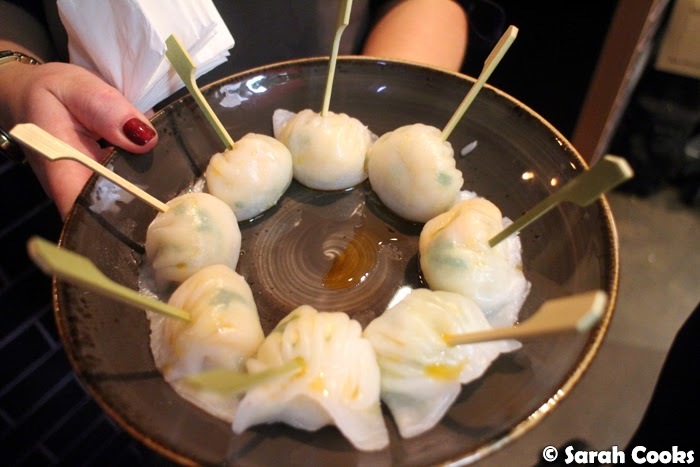 We were served a good range of items from the menu, primarily focusing on the dumplings. 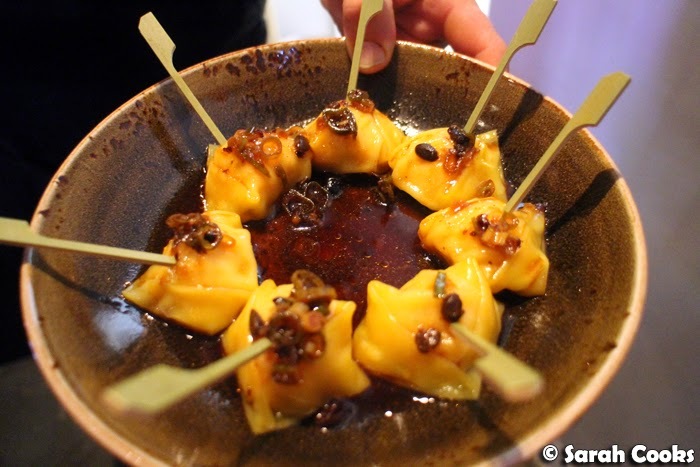 We tried a lot of different items, so I won't go into great detail about each one, but what I will say is that the dumplings were all of high quality, and all tasted different. 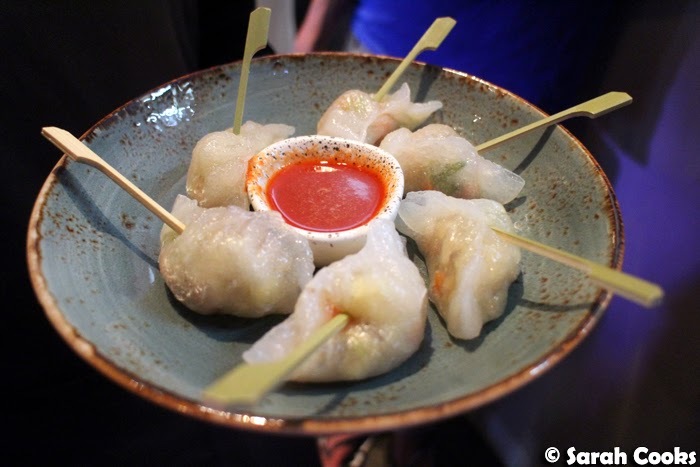 You know how sometimes you can go out and eat a whole bunch of different dumplings, but they all taste kinda the same? Not here - they all had different skins, different fillings, and each one was unique. 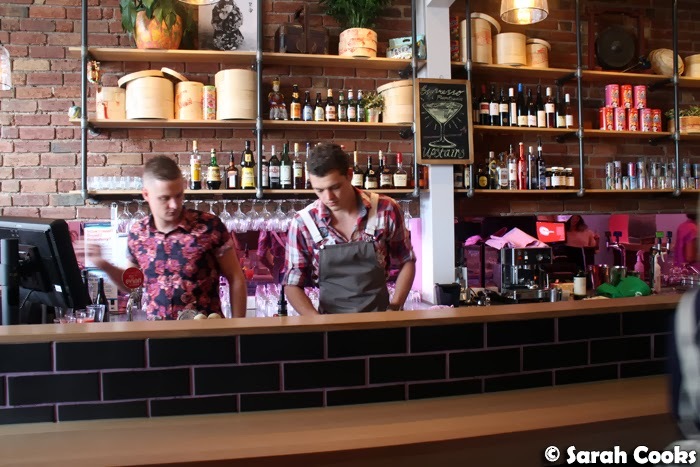 The menu is divided into "Small Bites", "Salads", "Dumplings" and "Desserts", so there don't seem to be a lot of big filling options, but rather a range of little snacky items to have with drinks. 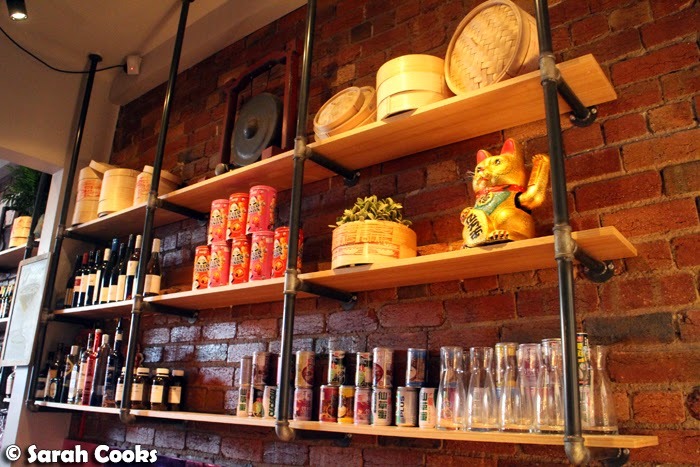 The dumplings are priced between $9.50 and $14, with four dumplings per serve. 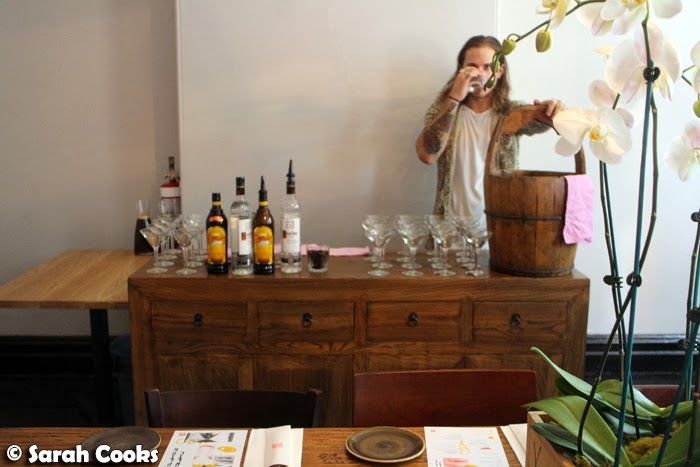 Whilst I really enjoyed the food and would recommend a visit - I would caution that if you want to have a full meal, and not just snacks with drinks, it could get very expensive very quickly. 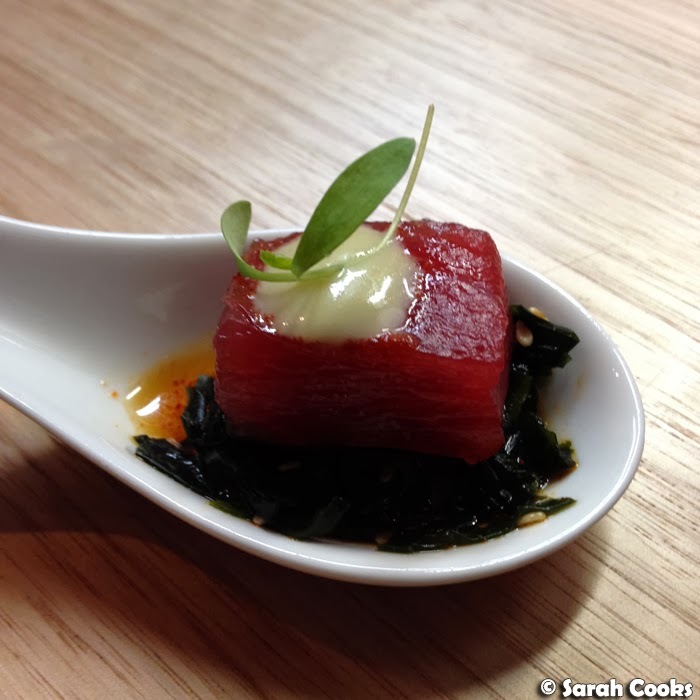 The tuna sashimi was super fresh and I liked the combination of flavours that came with it - different enough from regular sashimi with soy sauce to be interesting, but not so different that it was jarring. 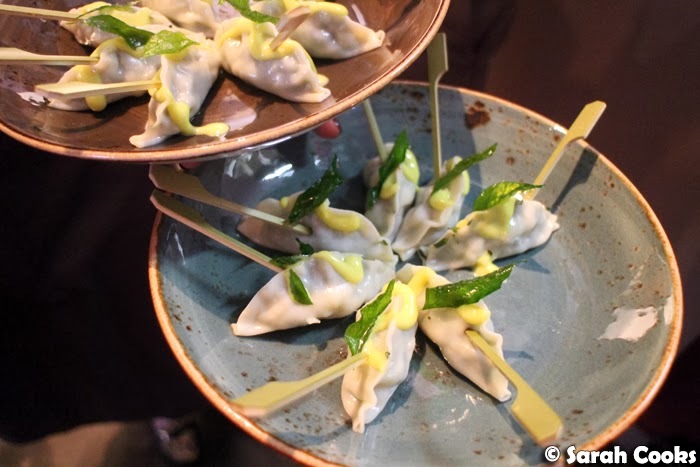 I think these squid, shrimp and curry leaf kewpie dumplings were my favourite savoury ones of the night - the little fried curry leaves on top really made them stand out. There were big, chunky pieces of prawn in the har gao - yum. 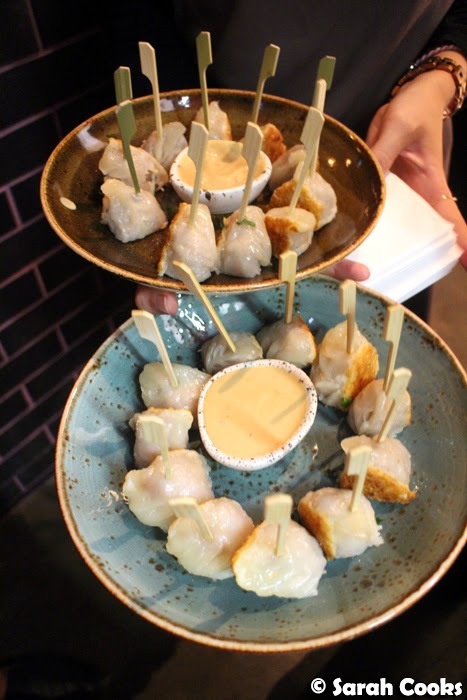 I'm sure now you can see how varied all the dumplings were - there were influences and flavours from Cantonese cuisine, Northern China, South East Asia, India and more. 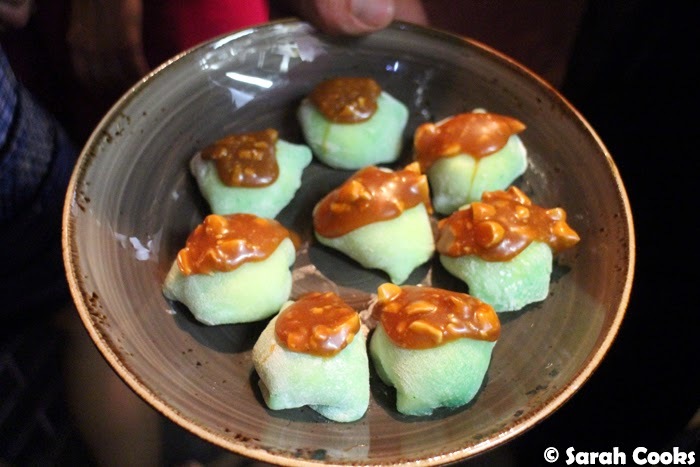 These little mochi were filled with a lemon ice-cream (which literally tasted like a lemon tart!) and topped with an addictive salted almond caramel. 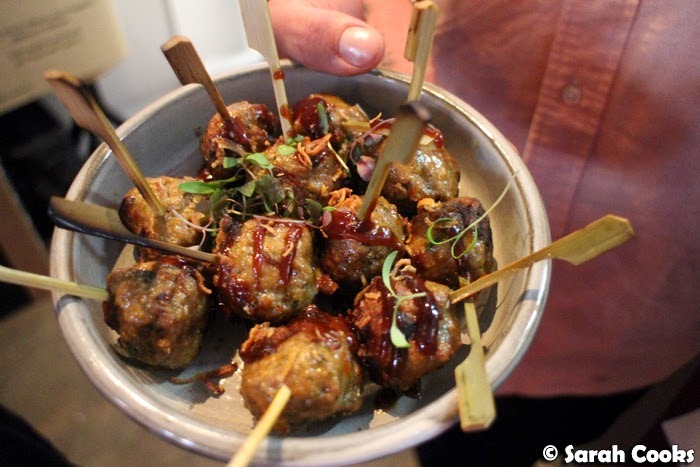 Thanks to the Charlie Dumpling team for a really fun night and all the delicious food! 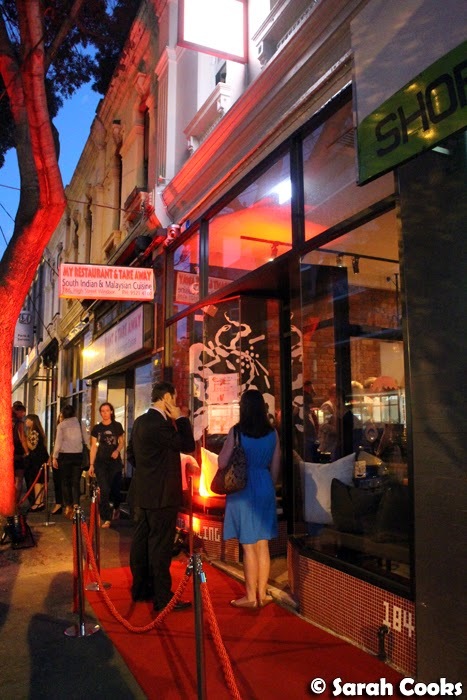 Sarah and Jimbo attended the launch of Charlie Dumpling as guests. Hey hey! 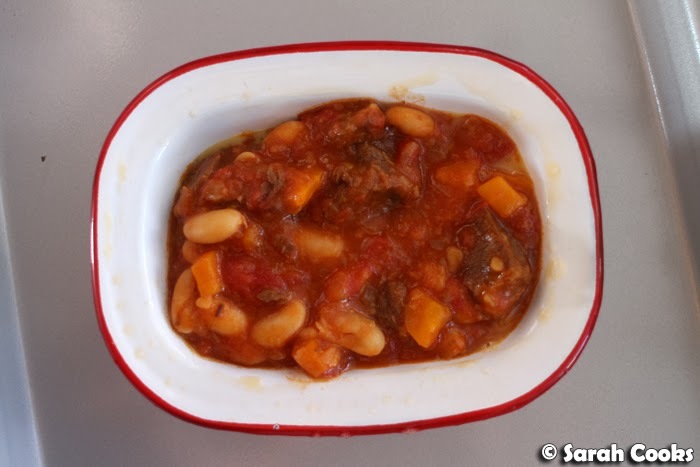 Quick recipe post for you today! It's going to be mainly photos because I'm flying off first thing tomorrow morning for a long weekend. Yay! The dough is easy to make - just stir together some flour, salt, wine and extra virgin olive oil, and knead it a little until smooth. (I guess you could use sunflower oil if you wanted to keep in with the sunflower theme, but olive oil tastes and smells so nice!) It's so easy to work with. 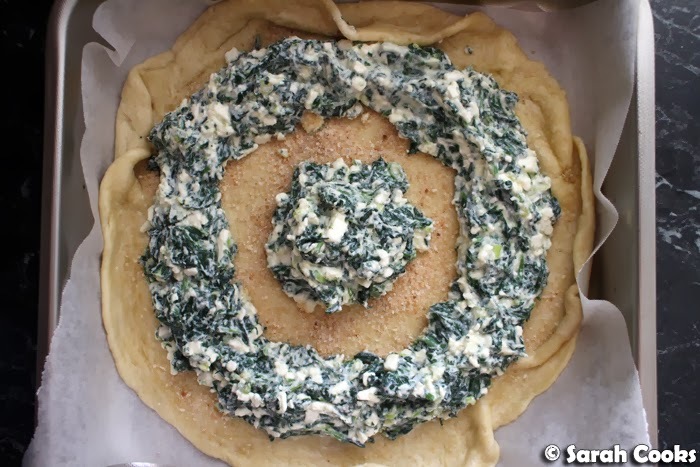 The dough can rest while you make the filling - cook down some spinach leaves, drain and chop, then add ricotta, feta, egg and spring onions. 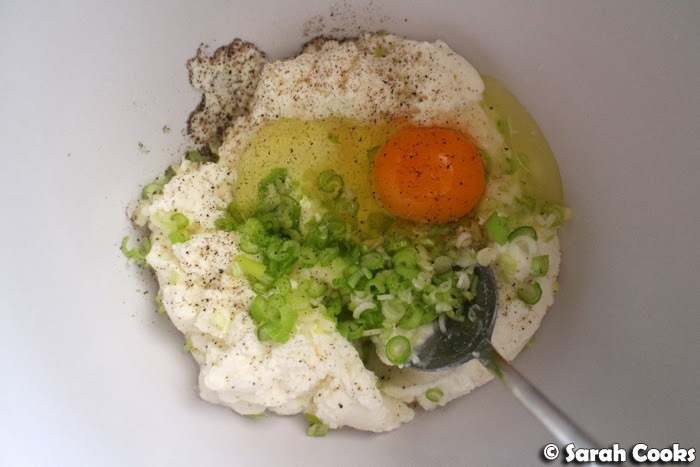 (The spring onions were another one of my additions - I often find ricotta can be a bit bland, so I thought it would be a good way to flavour it up!) Please also notice that I splashed out on the expensive ricotta and proper Greek feta, haha. The dough is super easy to roll out - I found that I didn't even need to flour the bench, as the oil in the dough prevented it from sticking. Let's have a look as the assembly. 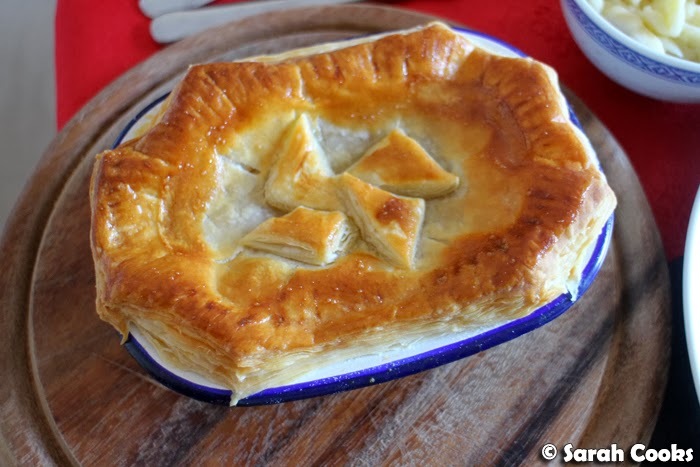 By the time I got to this point, I realised that it would be too tricky to keep folding the pie in my high-sided tray (despite the high edges, it's the only one I have that's big enough to fit the pie), so I carefully lifted it out of the tin on the baking paper and kept going on the bench. Once the lid is placed on, and you have sealed the centre mound with a mug or bowl, you could neatly trim the edges and seal them by pressing down with the tines of a fork... but I didn't want to waste any dough! (I love bread and dough!) So I just folded the dough around and pressed it shut as neatly as I could. The next step is to slice the "petals" of the border. I think it looks best in relatively small slices - I went for sixteen. The tricky part (although it's not really that hard) is twisting the little petals on a ninety degree angle. And there is your sunflower! Then I glazed it with egg and baked it. Ta-dah! Quite easy and so impressive! It's not just pretty, but tastes great too. The wine in the dough is a great touch - when it's baking it gives off that awesome sour aroma, much like yeast would in a bakery. Smells so inviting! I've only ever had spanakopitas made with filo pastry before, and I really liked the thicker, slightly bready pastry on this version. 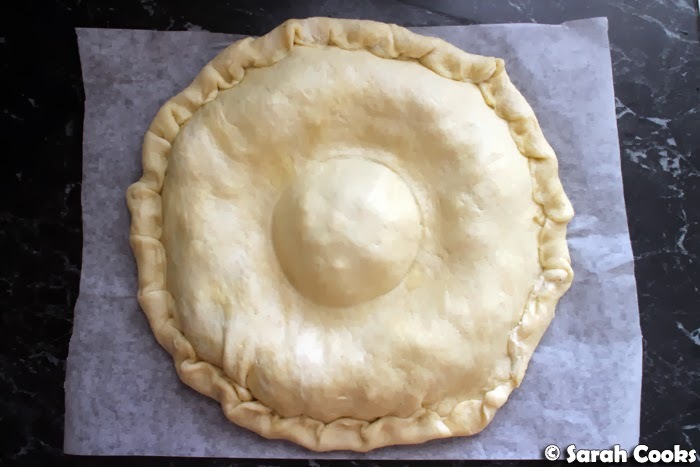 If you couldn't be bothered doing the whole sunflower thing, you could definitely use the dough and filling to make "normal" shaped pies or little pasties or whatever. Like I said, the dough is pretty easy to work with so I think you could be quite creative with it. 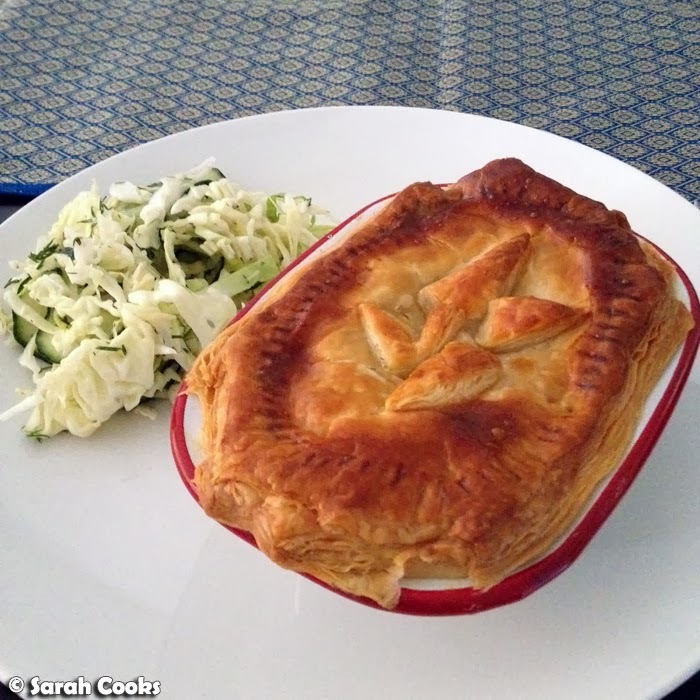 Thanks so much to Anna for sharing the recipe! 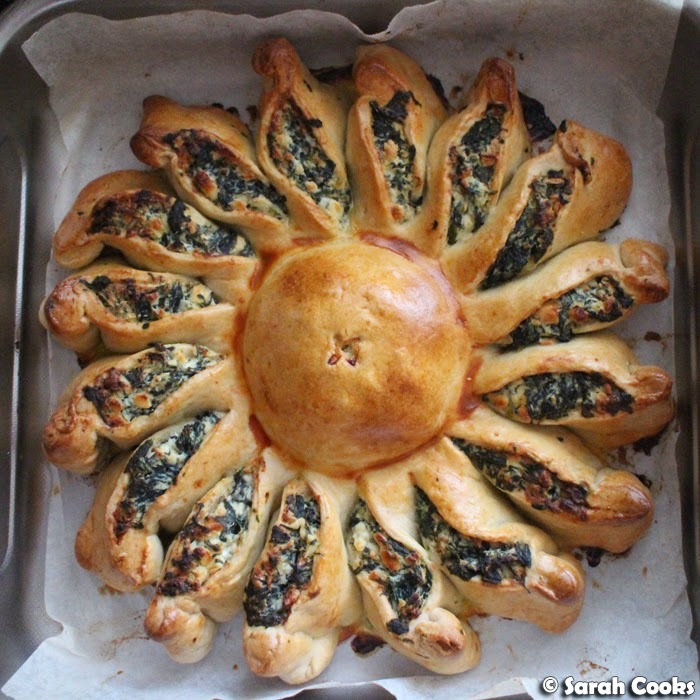 Please check out her wonderful blog for lots of great Cypriot family recipes and other yumminess! For the dough, stir all the ingredients together. Knead gently by hand until the dough comes together and is reasonably smooth. Cover with cling wrap and set aside. For the filling, cook the spinach leaves in a large frying pan with a splash of water until wilted. (You may need to do this in batches). Place in a sieve over a bowl and allow to drain. Chop the spinach with a pair of kitchen scissors in the sieve. 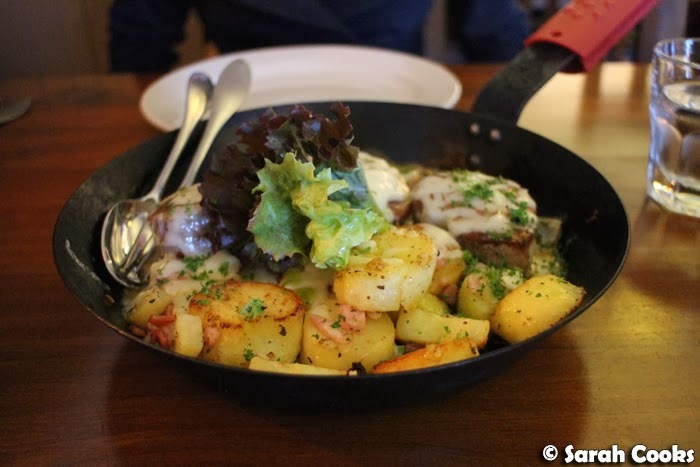 Press down with the back of a spoon (or a potato masher!) to squeeze out the excess water. 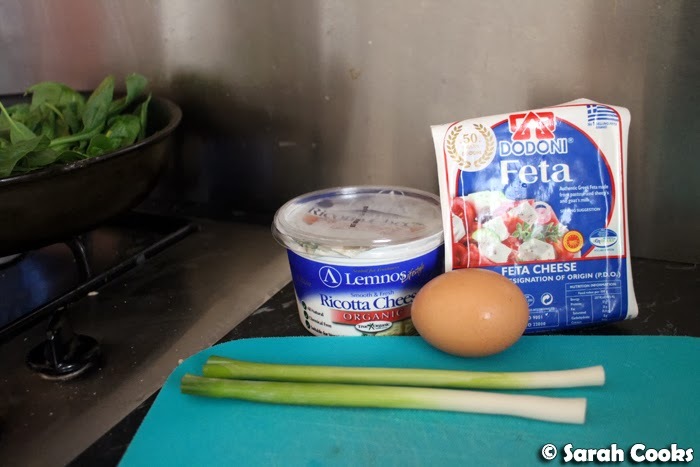 Stir together the ricotta, feta, egg, spring onions and drained spinach. Season with pepper. 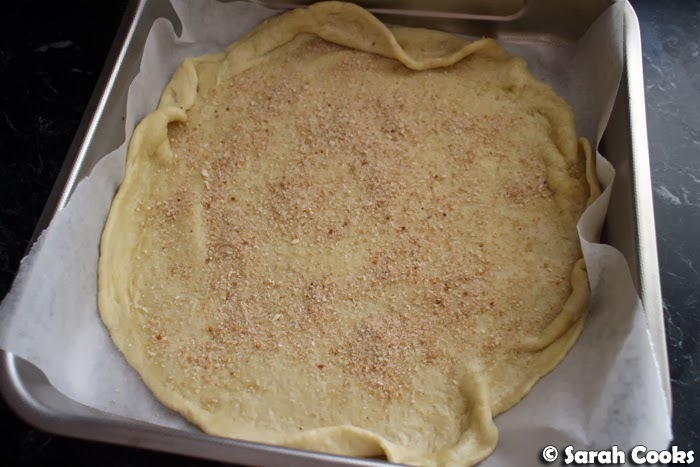 (No need to add salt, because the dough and feta are already salty). Stir well to combine. 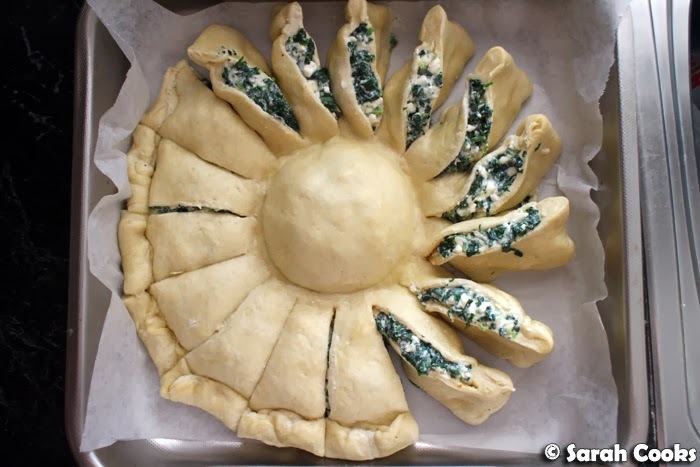 Divide the dough into two even pieces. Roll out one piece into a rough 30 centimetre circle. Place on a lined baking tray and sprinkle the breadcrumbs over. 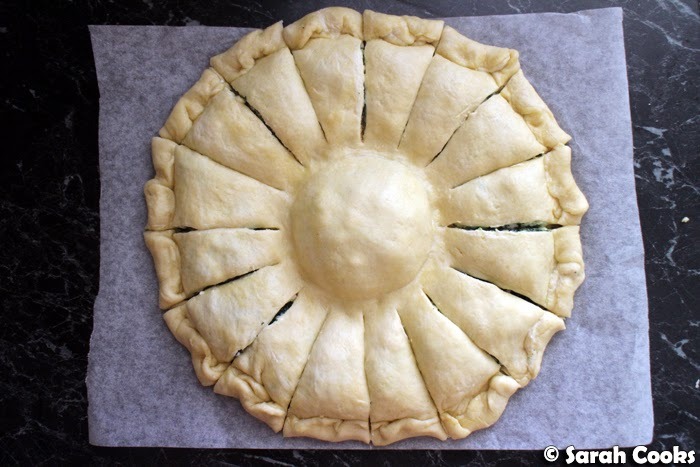 Dollop a large spoonful of the spinach and cheese mixture into the centre, then make a circle with the remaining filling. (See above pictures!). 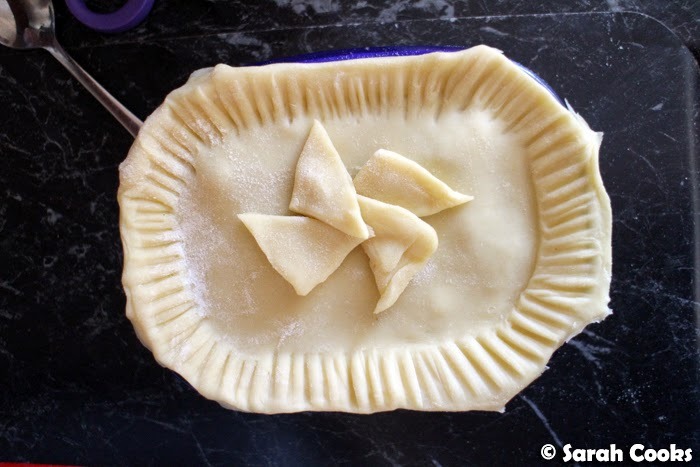 Roll out the remaining piece of dough to a similar size, and gently place on top of the pie. 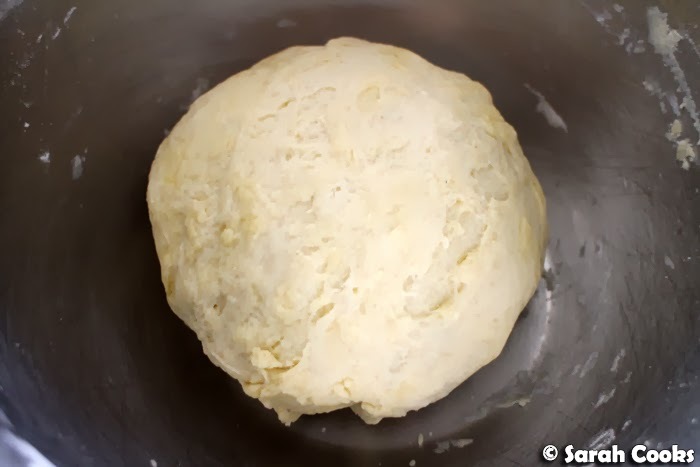 Press the dough down around the middle mound of filling using a mug or small bowl. 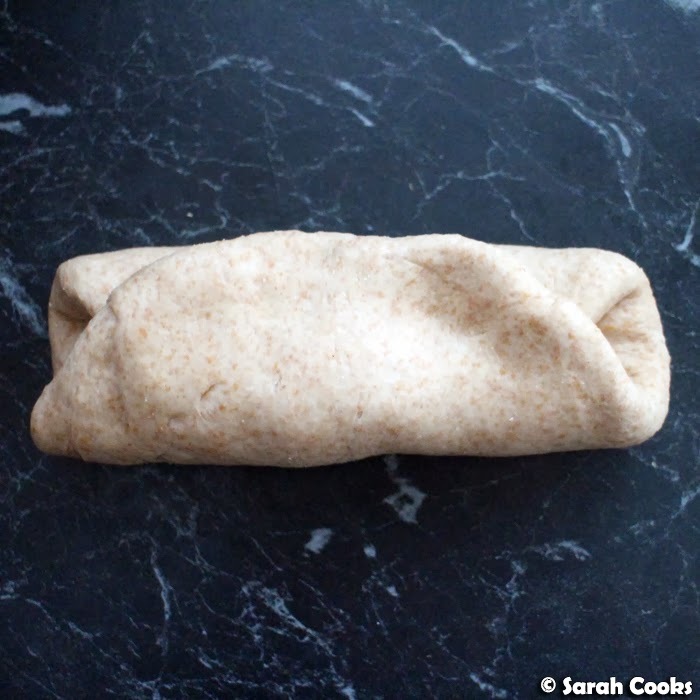 Fold the dough around the edges and press to seal. (You can trim them neatly and crimp with a fork, but I prefer the fold and squish method). Use a sharp knife to cut the borders into small slices, radiating from the centre. 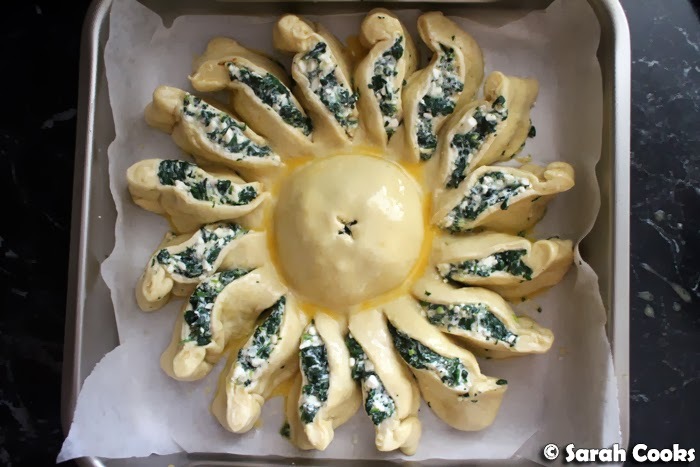 Turn each slice 90 degrees so that the cheese filling is exposed and the dough is on the sides. If necessary, press them down a little to keep them stable. 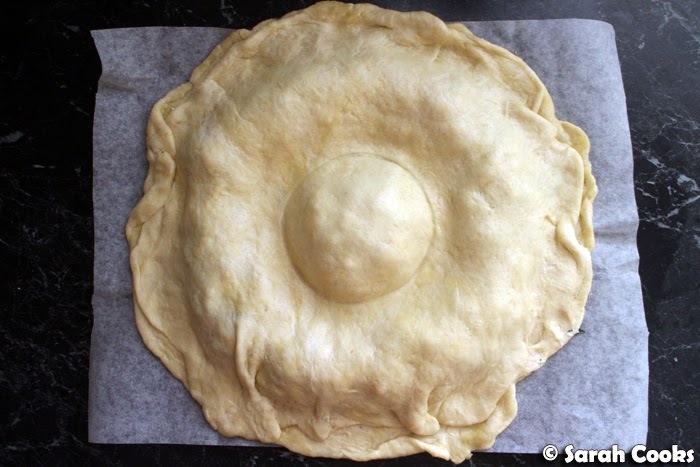 Beat the extra egg and brush all exposed pastry with beaten egg. Bake for an hour, or until the dough is golden brown and cooked through.